EMbaffle offers energy and CO2 savings to clients through optimised heat exchanger performance using innovative technology. We offer clients a flexible range of service options. EMbaffle's team of technical specialists can provide project management services and design solutions to engineering procurement contractors and end users for their heat exchanger operations ensuring optimal heat integration and clean, safe and reliable equipment. The company provides design services for EMbaffle® heat exchangers and a comparison of EMbaffle® solutions with other types through HTRI design software, for which EMbaffle is now an option. 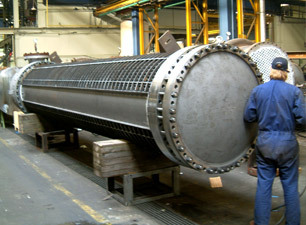 EMbaffle® technology is available under licence to heat exchanger manufacturers and expanded metal suppliers. The company offers licensees engineering consulting services to design review and verify the thermal performance of EMbaffle® exchanger designs. EMbaffle can execute entire heat exchanger projects from feed study through delivery, hook-up and commissioning. The company has a combined plant operational knowledge of more than 100 man years for upstream and downstream processes, resulting in a whole-system approach to its solutions. All EMbaffle products and services are available through our office in Alphen a/d Rijn. Find out more about specific benefits provided by EMbaffle® heat exchanger technology for the above applications.